One of the better known funny car drivers of the 70's and 80's was Raymond Beadle. 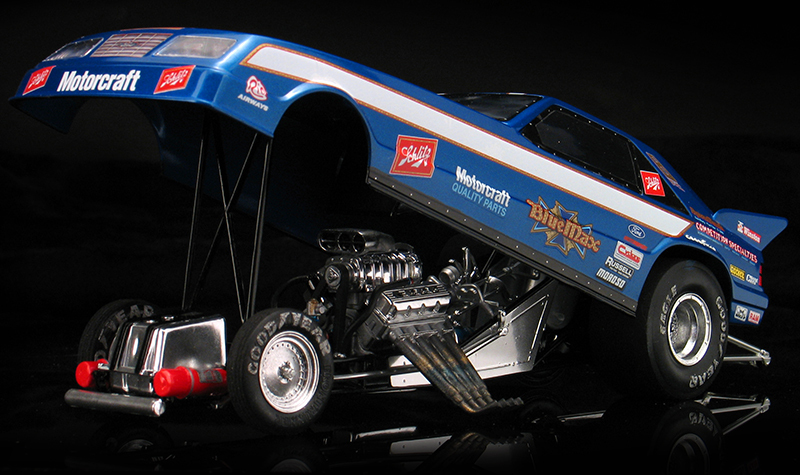 Beadle was the driver and owner of the "Blue Max" Funny Car. 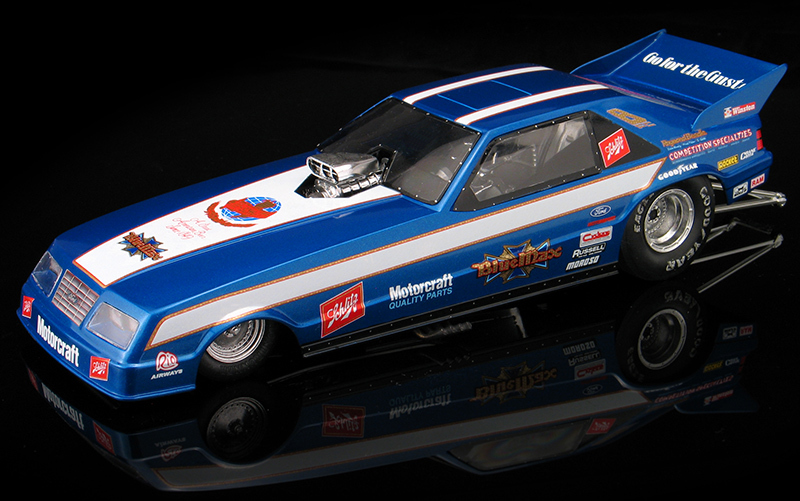 Beadle won three consecutive NHRA Funny Car championships from 1979 to 1981 and three IHRA Funny Car championships, 1975-6 and 1981. 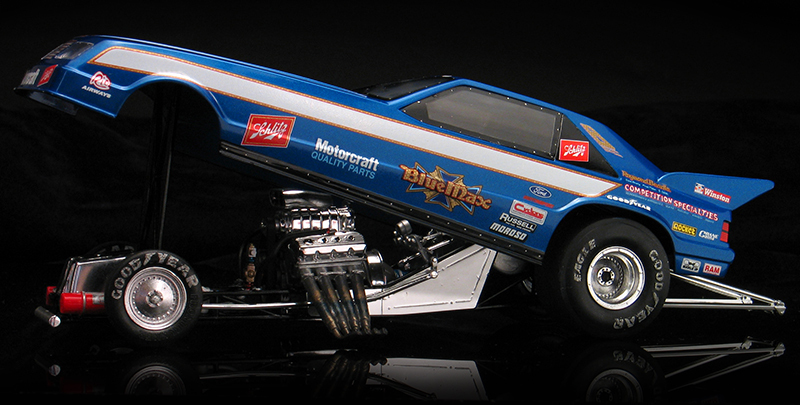 He drove a series of Ford Mustang bodied funny cars wearing a trade mark metallic blue paint scheme. 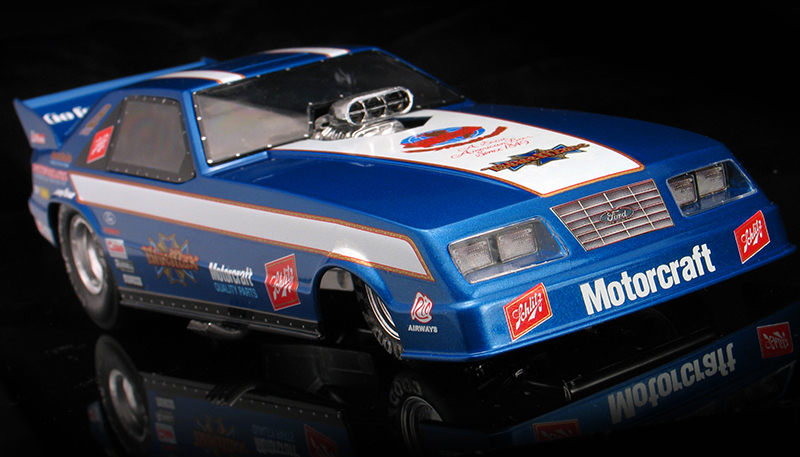 In 1984, he scored back-to-back wins, in Englishtown and Denver in this '84 Schlitz Beer sponsored Ford Mustang. 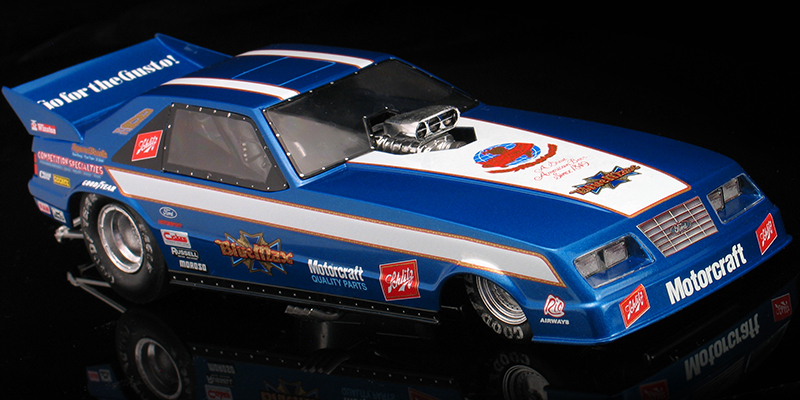 I've been working on building a series of replica 1/25th scale "Blue Max" funny car models and this 1984 Ford Mustang is the second one I've finished. 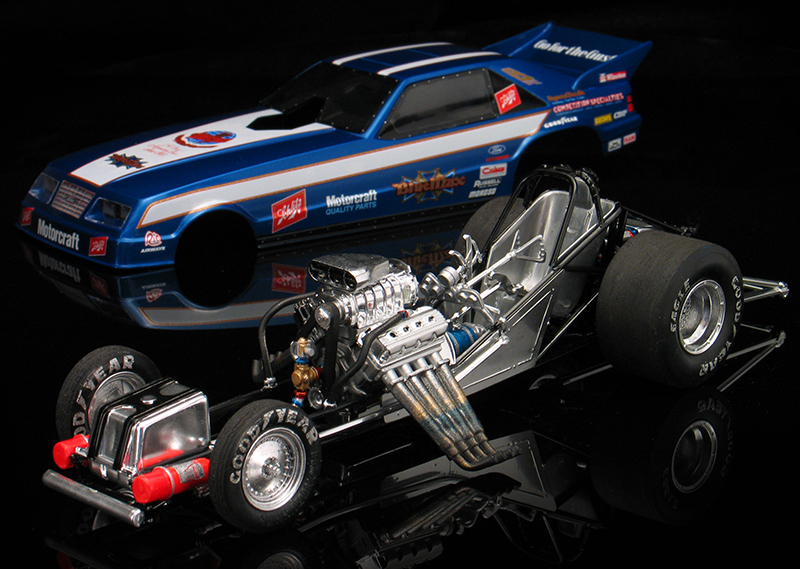 I built my replica "Blue Max" funny car using an '80's vintage 1/25th scale Monogram 7-Eleven Mustang funny car kit. 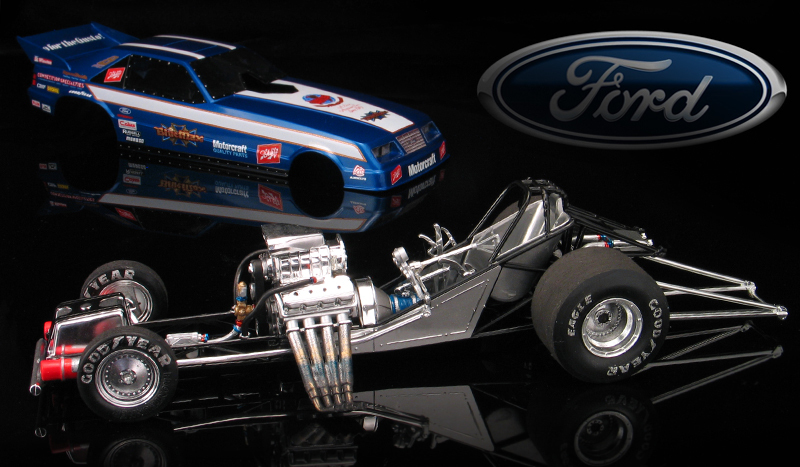 This is a really nice kit and is nicely detailed, but it took some modifications to replicate the famous "Blue Max." Firstly, I built a new rear wing for my car. After studying reference photos of the actual car I noticed the real Blue Max Mustang had a substantially larger rear wing then the one in the Monogram model kit. I modified the rear of the body and scratch-built a new rear wing from sheet styrene to match my photos. 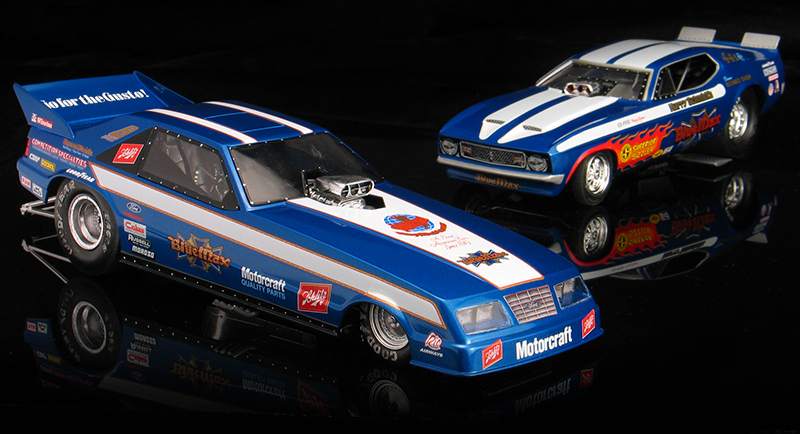 The Monogram kit also includes a set of Weld Racing wheels but the Blue Max car ran on a set of Cragar SuperTrick wheels. Monogram included a correct set of Cragar SuperTricks in some of their other funny car kits but I didn't have one of those kits, so I bought a set of resin wheels from Competition Resins. These wheels came unplated so I had to paint them with Alclad to match the polished wheels of the real car. I also detailed the kit tires with Slixx Goodyear tire decals. After applying the tire decals I dry brushed them with some flat black paint. If you look really close at real drag slicks, the tire lettering is usual stenciled on and starts to flake off pretty quickly. Dry brushing some flat black paint over them helps give the lettering a patina that adds scale realism. I also dry brushed the header in multiple colors of gold, blue, silvers and flat black to represent the discoloration that often occurs on these parts. I painted the body with Tamiya Mica Blue straight from the spray can. The paint went down very smooth and glossly, so I didn't clear coat the body as I normally would. 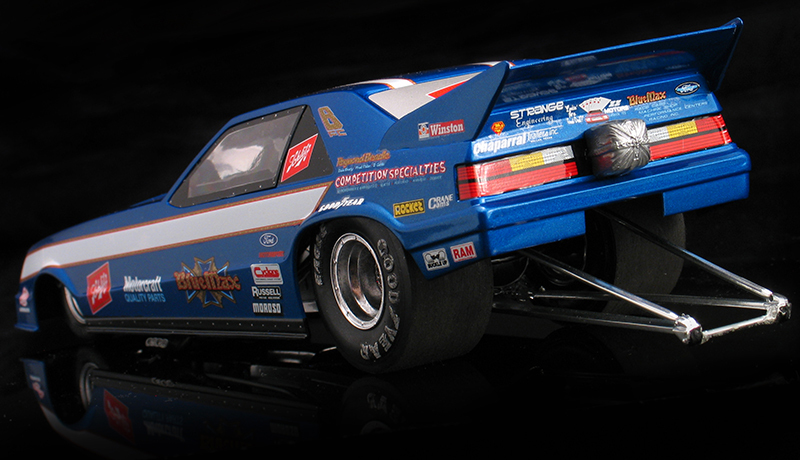 Slixx makes a very nice decal set to replica the '84 Blue Max car and I used them on this model. The only difficulty I had using them was on the long white side stripes which took multiple sessions with decal solvent to get the decals to lay over the front wheel arches. They fought me, but persistence finally won out. Most of my modeling friends that know me also know how much I despise wiring engines and chassis, so as per my usual building style the rest of my model was built out of the box. With just some simple paint detailing though this kit really comes to life and makes for a very nice shelf piece. 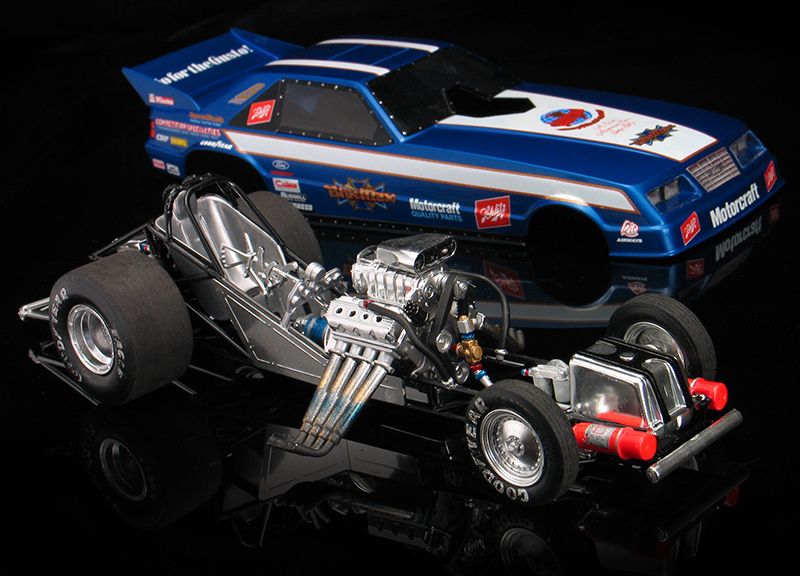 Here you can see both of my Blue Max funny cars together. 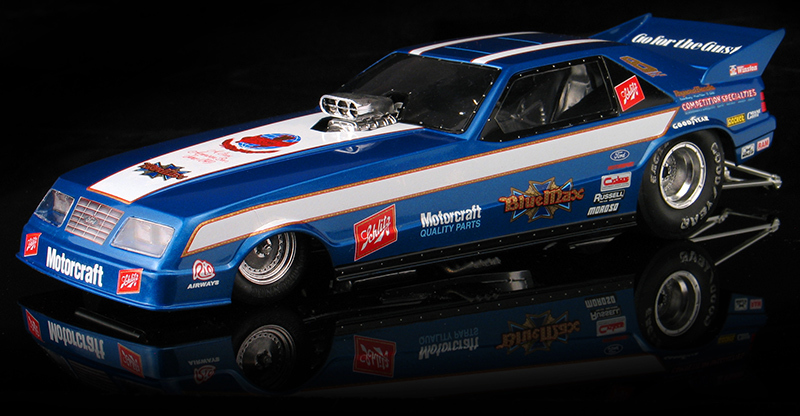 For a closer look at my '72 Blue Max Mustang funny car model, click here.